Don Porritt recently had conversation with Jon Krosnick, a professor of social psychology at Stanford University, and internationally recognised expert on survey design about putting "none of these" as an option in an association matrix, or in fact, anywhere in a survey. The issue arose out of a Lightspeed presentation where they recommended always having a "none of these" option to reduce 'satisficing' (in short, giving a plausible but rubbish answer). Don and Krosnick agreed that "none of these" should always be offered, and not just for people who don't have a good answer. In some situations, it's a legitimate answer in its own right. If an interviewer asks you which breakfast cereal you like, and you have tried them all and hate them all, then "none of these" is the answer you should give. Filter question 1. "Do you have any knowledge of breakfast cereals you can find in the supermarket these days?" Filter question 2. "do you care at all about the quality of breakfast cereals these days?" This way, you elimate the people who either don't know, or don't care, from the sample of responses. NSW voters are disillusioned with the State Labor Government led by Morris Iemma, according to the latest Taverner poll, published in the Sun Herald and also reported in the Sydney Morning Herald and on radio and television news. There has been a sharp fall in support, to the extent that if an election were held right now, there would be a landslide win to the Liberal/National Coalition. Just 4 months ago, Labor would have continued its winning streak of well over 10 years. There have been many issues leading to the decline in Labor support in NSW, not least of which have been the Iguana Joe’s alleged staff intimidation issue involving former NSW Education Minister John Della Bosca and his Federal MP wife Belinda Neal, transport crises, the Spit Bridge malfunction, tollway cash-back disclosures and the much criticized proposal to privatize the State’s power industry. In the latest Taverner Poll, Labor trails the coalition by a massive 12 points, at 44 to 56 percent. In February Labor was still holding onto the small lead it had at the 2007 election, on 51 to 49 percent. Not all of these problems are attributed to just Morris Iemma’s handling of his leadership. There is no-one in the State Labor party who voters consistently believe preferable. For now, Morris Iemma remains the best option with voters despite widely reported calls from many for him to stand down. An unpopular electricity privatization policy has caused problems for the government on top of the Iguana Joe’s affair, rising petrol prices and transport problems. 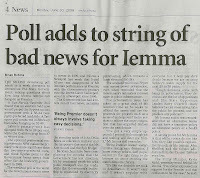 However the next election is a long way away, and as the February and June 2008 Taverner Polls show, public opinion is fairly easily influenced by bad news and media reports. Iemma must be hoping that in the next three years, the problems of today will be a distant memory in the mind of the voters. In the meantime, it is worth noting that it is not only Morris Iemma and Michael Costa who are strongly promoting a full scale power privatization plan, against the broader wish of the unions and the Labor Party at large; the Liberals have also come out in similar support, agreeing this is the only way to free up sufficient capital to introduce the massive infrastructure investments that have been so badly need across in the State for so long. For the moment, Labor is taking the brunt of community criticism off the plan. The voting public across New South Wales now firmly believe that Schapelle Corby is guilty as charged, according to this week’s Taverner Poll published in the Sun Herald Sunday 29 June. 53 percent say she is guilty, only 15 percent say she is innocent, though almost a third are still unsure. The findings come less than a week after the Channel Nine documentary, Schapelle Corby: The Hidden Truth, was aired. This a far fall from grace for the woman behind bars in a Bali prison. At the height of media interest surrounding her trial, over 90 percent of Australians thought she was innocent. Despite believing her to be guilty and having spent 3½ years already in prison, most people still say she should remain in prison though would support a Federal Government initiative for prisoner transfer and see her spending her remaining jail time back here in Australia.